VANCOUVER, Oct. 23, 2017 /CNW/ - Mawson Resources Limited ("Mawson") or (the "Company") (TSX: MAW) (Frankfurt:MXR) (PINKSHEETS: MWSNF) announces further high-grade gold results from outcrop and mini-drill sampling at the Company's new East Rompas discovery. 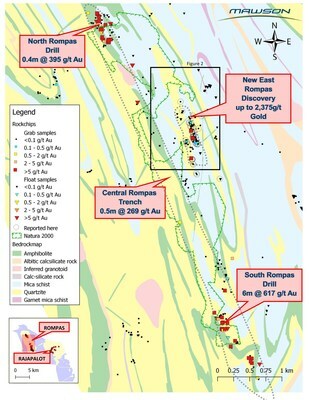 The recently discovered East Rompas prospect lies within Mawson's 100% owned Rompas-Rajapalot project in Northern Finland, 500 metres east of the 6 kilometre long Rompas high-grade gold vein system. Initial discovery results from East Rompas were published October 11, 2017. Geological mapping, sampling, geophysics and drill planning is now being accelerated in response to the very positive results returned to date. Mr Hudson, Chairman & CEO states, "East Rompas is an exciting new discovery by the Mawson team, with the mineralized footprint now expanded to two semi-parallel zones over 750 metres of strike. Finding visible, high-grade gold at surface, in outcrop is rare, and the significance of discovering multiple outcrops with grades up to 2,375 g/t gold cannot be under-estimated. We are highly encouraged by the presence of gold in structural fabrics and the association with silicate and sulphidic alteration, that may indicate potential for disseminated gold mineralization. Geophysical crews are working at site and with the area fully permitted we plan to be drilling in early December." East Rompas is located approximately 500 metres east of the 6 kilometre long Rompas high-grade vein system where drill results include 6 metres @ 617 g/t in drill hole ROM0011 (Figure 1). Gold mineralization discovered in outcrop is fracture controlled and associated with strongly biotite-altered mafic rocks, believed hydrothermal in origin, and similar to the undrilled Joki discovery at Rajapalot. 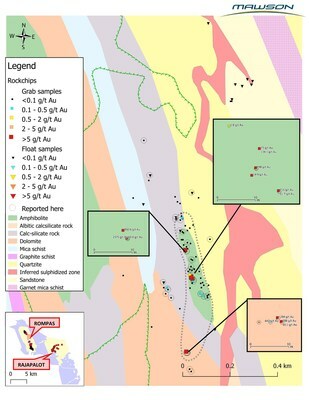 Gold mineralization has been discovered sporadically in two semi-parallel trends within a 750 metre long NNW-SSE oriented zone, where the width of the individual occurrences are at least 20 metres (Figure 2). Outcrop is poor and forms less than 5% of the area. The northern mineralized zone is better exposed than the southern zone. Gold mineralization is hosted by mafic volcanics with variable biotite, chlorite, carbonate, and albite enrichment. Gold is associated with biotite-rich lenses, sub-vertical veins and fractures and zones with elevated radioactivity. The biotite-rich alteration of the mafic host rocks appears as foliation-parallel shear zones and lenses and in cross-cutting veins or fractures. Importantly, in sample 243174 (642 g/t gold), visible gold is found as disseminated grains in biotite-quartz granofels (Photo 1). Mafic volcanics are tightly folded with included folded carbonate-amphibole veins. The area is fully permitted for diamond drilling and is located outside Natura 2000 areas, within the recently permitted Männistö exploration permit. Geological mapping of the East Rompas prospect continues, accompanied by additional ground magnetics at 25 metre spacing and VLF-R at 50 metre spacing. Diamond drilling is planned during December 2017. A hand-held minidrill was used to sample outcrops where sampling with a geological hammer was not possible. Single drill samples and foliation-parallel composite samples were obtained using the minidrill which was drilled up to 20cm into outcrop areas. Analytical samples were transported by Mawson personnel or commercial transport from site to the CRS Minlab Oy facility in Kempele, Finland. 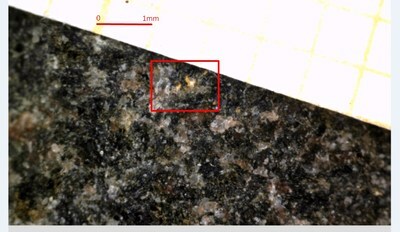 Samples were prepared at Kempele and analyzed for gold at Raahe using the PAL1000 technique which involves grinding the sample in steel pots with abrasive media in the presence of cyanide, followed by measuring the gold in solution with flame AAS equipment. The QA/QC program of Mawson consists of the systematic insertion of certified standards of known gold content, and blanks the within interpreted mineralized rock. In addition, CRS inserts blanks and standards into the analytical process.